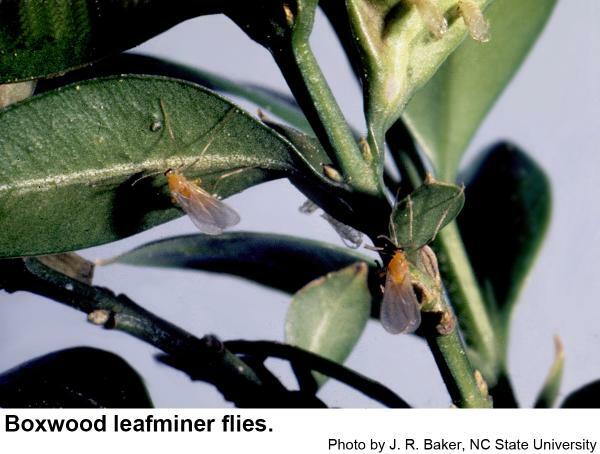 The boxwood leafminer is the most commonly reported pest of boxwoods in North Carolina. Accidentally introduced from Europe, this small fly seems to prefer American boxwood, although English and Japanese boxwoods are also susceptible. Boxwoods infested with this leafminer develop blisters on the lower leaf surface (Figure 1). Infested leaves are usually smaller, off-color and drop sooner than healthy leaves. Heavily infested boxwoods usually have sparse foliage and poor color. Shrubs are generally not killed by leafminers. Figure 1. 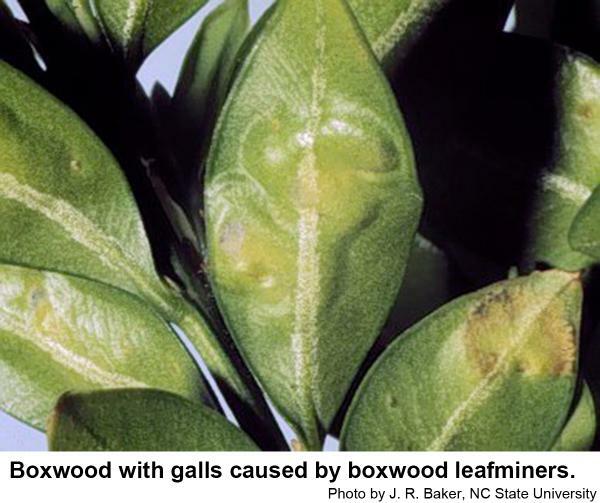 Galls on boxwood leaves caused by the boxwood leafminer. Adult leafminer flies emerge over a two-week period in early spring just after the boxwoods have put out their new growth (about the time weigelas bloom). These flies are like tiny, orange mosquito-like (about 1⁄8 inch long) insects which swarm around or cling to boxwoods. After laying eggs in the leaf tissue, the flies die. There is one generation per year. Tiny, whitish maggots hatch and feed inside the leaf (Figure 3). As they grow (up to 1⁄8 inch long), the maggots become bright yellow. Several maggots may develop in a single leaf. Their feeding induces the formation of blisters on the lower leaf surface inside of which the maggots develop for about a year. Very early the next spring, the blisters form a thin, translucent spot called the window, and the maggots develop into orange pupae. Fully developed pupae wriggle through the windows and hang down from the underside of the leaf (Figure 4). Soon adult flies emerge from the pupae to begin a new generation. Figure 2. Adults of the boxwood leafminer. Figure 3. Larvae of the boxwood leafminer. The lower surface of the leaf has been removed to show the larvae inside. Figure 4. 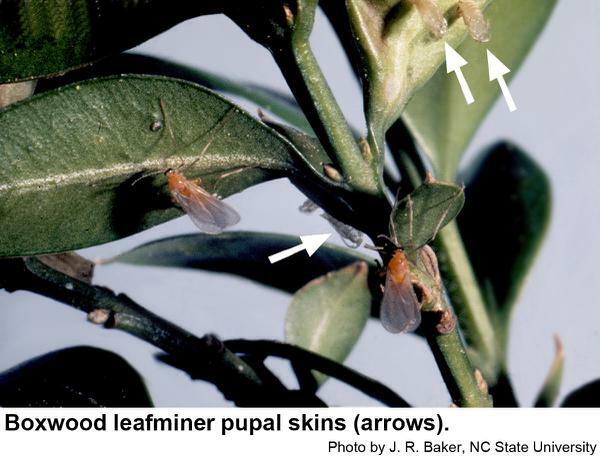 The cast skins of boxwood leafminers hang down from the undersides of leaves. One of the pesticides listed in the table can be applied just as the boxwood leafminer flies appear in the spring. The flies emerge just after the new growth appears on boxwoods in April. At other times of the year, use a systemic such as Merit, Marathon, Tristar or Acelepryn as soil drench or soil injection. For the latest chemical recommendations, see the North Carolina Agricultural Chemicals Manual. Other homeowner lawn and garden products may be helpful. English boxwood seems less affected and Ohio reports 'Suffruticosa,' 'Pendula,' and 'Argenteno-variegata' as less susceptable. Consult the labels and your local Cooperative Extension agent. † Spray when adults are flying. * Suitable for home use. Recommendations of specific chemicals are based upon information on the manufacturer's label and performance in a limited number of trials. Because environmental conditions and methods of application by growers may vary widely, performance of the chemical will not always conform to the safety and pest control standards indicated by experimental data. 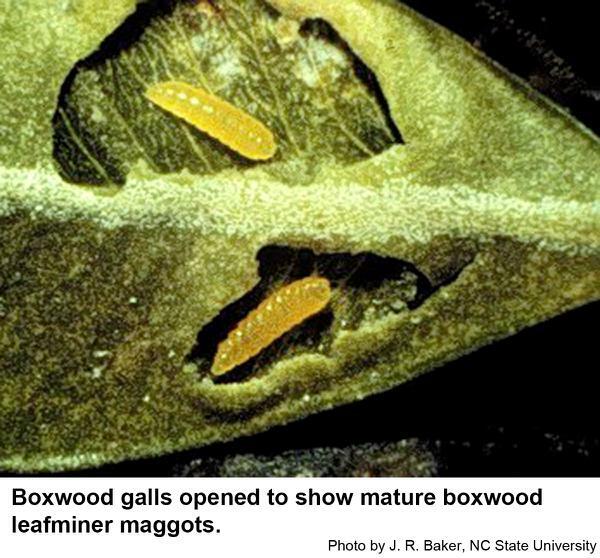 Boxwood Diseases & Insect Pests. Kluepfel, M., J. M. Scott, J. H. Blake, and C. S. Gorsuch. 2009 (revised). Clemson Coop. Extension Home & Garden Information Center.